As the world’s longest-running and hardest rocking rock band in history, The Rolling Stones have created timeless music that today is now even more amazing to hear because of ABKCO’s digital re-mastering of original recordings into high resolution formats. Exclusive in DSD at Super HiRez.com, all of the tracks come from the ABKCO masters and utilize Direct Stream Digital (DSD) — which is what ABKCO successfully used in the Rolling Stones albums reissued in 2003. Even if you've heard these tracks a zillion times, this ABKCO release gets you as close to hearing studio playback as you're likely to get!" Customer Reviews (4.75 Stars) 4 person(s) rated this product. The sound is as if the band is actually in the listening room with you. There is depth, as Mick is in the middle, but farther back than the other players. Many of the instruments are eerie in how present they seem. I've listened to it many times since I've downloaded it. The only caveat is that the tops of the higher frequencies have some roughness to them, which I am guessing is probably due to the quality of the original tape. Whenever Mick sings a high note, you can hear a static-like halo over his voice. I don't know that there is anything they can do about that, so I am resigned to think that this might be the best sounding Rolling Stones we can ever get. Even so, when things don't go high frequency, this is a somewhat intimate recording with nice depth and breadth. It feels quite intimate. I would download it again. I agree with the other comments. Would sure like see Beggars Banquet on DSD. I too have owned every release and format for this album. but this DSD of Let It Bleed is the best. it sounds amazing. you wont regret buying this at all. I've listened to Let It Bleed at least a thousand times, starting with the vinyl pressing in the early seventies then the CD, then the 176/24 and now this DSD version. The DSD is arguably the best, certainly it trumps any of the other digital formats and is essentially the same to my ears as the vinyl. Those of you who think Exile is the Stones' best album, sorry you're wrong. 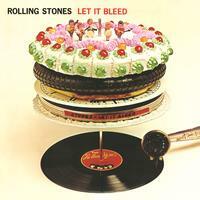 It is, of course, Let It Bleed and this is the best digital format available. If you have DSD playback capability, get this.